What is lost in Chicago Public Schools’ custodial privatization scheme? During my first year of teaching in Chicago Public Schools, at Corliss High School in Pullman, a colleague and I started a boys’ volleyball team. We had only three volleyballs for practice, but the biggest problem I had was an essential one—I had a net that could not be raised. During the first practice, I ran around frantically asking about a missing tool, called “a crank” in volleyball terms. My athletic director sent me to the custodian, who first responded by asking, “Boys’ volleyball? We never had that here.” He walked with me to the gym, and I showed him my useless net. He said he’d be back soon and reappeared with a socket wrench. It worked perfectly, and at the end of the practice, when I found him to return it, he said, “Mrs. Caneva, you can keep it for your season. I’ll find you if I need it.” We used it for the next three seasons. I thanked him for this and during the next three years that I worked there, I came to realize that besides keeping my classroom and the first floor impeccably clean, he was also the utility man for our building, stepping in to do almost anything asked, often going unnoticed. When I left Corliss, I wrote a thank you note to all the colleagues I was close with, including this custodian. At my current school, Lindblom Math and Science Academy in West Englewood, I continued to see the impact of a solid janitorial staff on students in ways that extend beyond the cleanliness of the building. We had a beloved custodian who worked most of his career at Lindblom. When he retired, our principal announced the news at a pep rally. The entire school gave him a standing ovation. Soon after retirement, quite unexpectedly, he passed away. Our students made him a memorial which sits outside of our school. In 2014, CPS decided to privatize janitorial services to two companies—SodexoMAGIC, led by former basketball star Magic Johnson, and Aramark, the company predominantly in charge of CPS’s lackluster food service. Before the privatization, most of our janitorial staff wore Lindblom sweatshirts and polos. After the switch, they were required to wear Aramark shirts, symbolic of a switch in our custodians’ allegiance—from a school community to a private company. At the time, CPS claimed that the change would save the district money, provide cleaner schools, and lessen the responsibilities of principals across the city. Instead, CPS has paid out hundreds of millions of dollars to companies that have left schools filthy—the Sun-Times found last month that just thirty-four of 134 schools inspected during a recent “blitz” of inspections passed—and workers stretched. 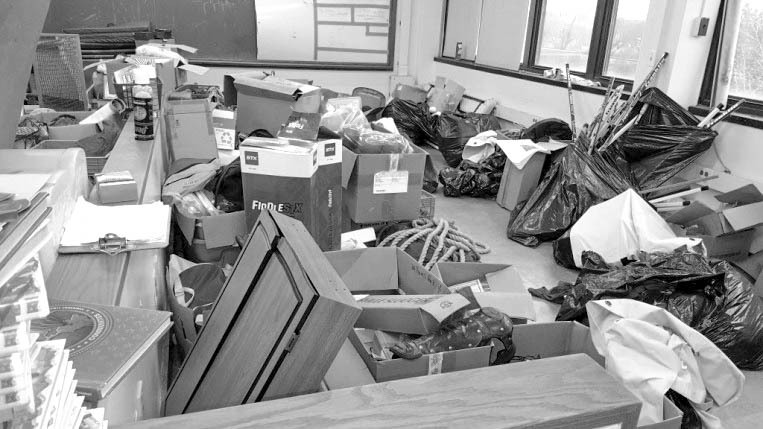 Some janitors have even reported to the Sun-Times that they were buying their own supplies to keep our schools clean, and that CPS officials had cheated to pass outside audits. CPS has never publicly quantified the amount of money saved or lost by these privatization measures, but in January 2017, signed a half-billion dollar contract with both companies to clean most of its buildings, and recently signed a $259 million addition to that contract. At Lindblom, which includes 1,350 students and nearly one hundred staff members, we have only two Aramark janitors working at the school during the day. What used to be a norm for cleaning has now become a form we have to fill out about our needs for cleaning. We also now have to pay extra money, from our school budgets, for services that used to fall under our custodial staff’s standard responsibility, such as setting up for standardized testing, school dances, and graduations. We lost several CPS janitors who were dedicated to Lindblom, including one whose son attended school here; they were sent to other school sites when the privatization took place. Relinquishing control of the custodians also meant relinquishing accountability, as schools no longer are in charge of hiring, firing, or even assessing them. Even though the media has reported on and parents citywide have massive complaints about the lack of quality privatization produces, CPS continues to push this practice forward without transparency in cost savings or in quality control. In my fourteen-year career at CPS, nearly all of the members on the custodial staffs in the three schools I have worked for have been people of color. They are poorly paid to begin with, and they are now facing poor working conditions which have turned into poor school conditions. All the while, the two private companies are not punished for their lousy performance except in empty threats from Mayor Rahm Emanuel. New CPS CEO Janice Jackson has taken the first steps in fixing the problem by spending an extra $7 million to hire 200 more custodians, and has stated that all of the city’s schools will be inspected by the end of the school year. But this comes after the media, outraged Chicago parents, the Chicago Teachers Union, and SEIU Local 1 (the CPS custodians’ union) brought the problem to the forefront. It is my hope that Jackson and other CPS leaders will begin thinking of practices that can assess these problems and others similar before they become crises. A next step would be to pull out of the venture that privatizes our custodians. In lieu of that, CPS needs to find ways to actually hold these companies accountable for their service. CPS also needs to be transparent with costs, as taxpayers’ dollars that once went to schools and their employees are now going to private companies serving up less than acceptable results. Our district has been nationally recognized for our students’ performance; it is the least we can do to provide our students with clean facilities and our custodians with better working conditions so that we can cultivate an environment conducive to learning. Gina Caneva is a fourteen-year Chicago Public Schools veteran who works as a teacher-librarian and Writing Center Director at Lindblom Math and Science Academy. She is a National Board Certified teacher and Teach Plus Teaching Policy Fellowship alum. She last wrote for the Weekly in November about CPS’s inability to provide good answers to questions from students, parents, and teachers. Follow her on Twitter at @GinaCaneva. During my career at LakeView High School we also had a magnificent chief engineer and custodial staff. As an art teacher I could always count on them to understand that found object art was not junk and that we needed extra paper towels. They even built shelves for our department in an unused closet. They were part of our school community. The only way to resolve this is to end the private contact and put the maintenance budgets and building supervision back to a cps employed engineer as it was prior to 2012 and since 1902. Privatized engineers can only be accountable to their profit motived employer ie.. SODEXO AND ARAMARK. Cps employed engineers and custodial workers are the only SOLUTION. Their loyalty is with Cps.